Planning a road trip from San Francisco to Napa Valley? You’re not the first to be drawn in by the spectacular views of steep rolling hills, lush valleys, and vineyards on the horizon of this rural paradise. Wine lovers from around the world come to Napa Valley to enjoy California’s finest wines in its most spectacular rural setting. Many travelers, however, don’t realize that the popularity of Wine Country leads to traffic making its way north of the compact Golden City. Private shuttles are an affordable travel solution for all wine connoisseurs and visitors alike. If you’re hoping to take a trip within the next year, you should plan several weeks in advance, so you can get the best coach available. 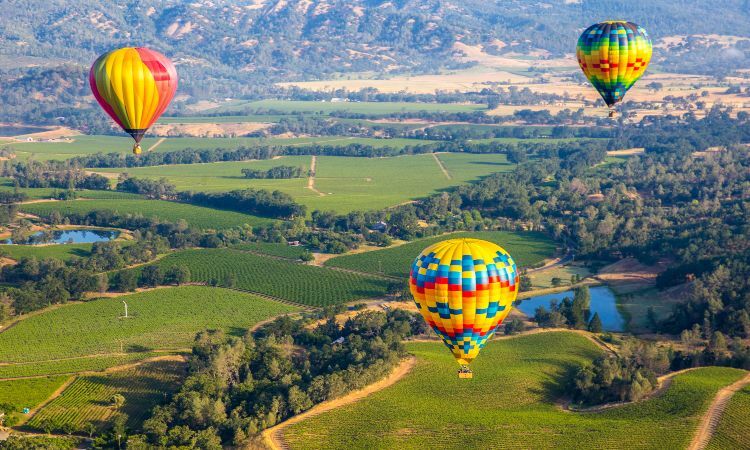 That way you can enjoy a smooth ride through Wine Country as your group partakes in all that the locally-acclaimed Napa Valley winery tours and tastings have to offer. Call us at 855-826-6770 for a quote on your California coach rental. A private shuttle bus will allow your group to take a scenic drive from San Francisco to Napa Valley with ease. Whether planning a trip to Napa for a wedding, private event or a company outing, each of your members will be accounted for. Your driver will plan the navigation of the trip by finding the shortest route between wineries, the ins and outs of pick-up locations and parking at hot tourist attractions that are most frequented by locals, neighbors, and tourists. Hop onto the Napa Valley wine bus in California’s Wine Country to tour Napa’s finest wineries. With a number of different destination options and stops along the way, the scenic one-hour ride comes with a panoramic view where you can admire the stunning sights of the valley and sip wine along the way. You can get off the bus on your schedule to visit multiple wineries during your trip. The shortest route to the wineries is through the scenic highway I-80 E. The hour and 20-minute route covers 74 miles of captivating landscapes and waterways. GOGO Charters shows travelers and wine connoisseurs the most beautiful views of the Pacific coastline with ease. Relax in the passenger seat of your private Pacific coach rental and enjoy the freedom of having less stress during your travels. Simplify your trip by removing those dreaded to-do lists from your trip itinerary and in your daily life. Book with us and our travel consultants will simplify and consolidate your travel logistics seamlessly. It’s also worth noting that during long trips it’s important to have access to comfortable reclining seats and a wide selection of entertainment options. Travelers can book luxury trips at affordable prices with a Pacific coach that comes outfitted with reclining seats, restrooms, and private windows so you don’t miss a view. If you’re looking to sightsee and save money during your travels, you can’t get much better than a relaxing bus ride. You will also want to consider the size of your private ride, as the comfort of the drive can make or break the event. An 18-passenger minibus is the ideal shuttle for a small private wedding to transport important guests to and from the vineyard and wedding reception hall. However, the 35-passenger and 56-passenger models are our most-popular charter buses for larger privately-held events due to their spaciousness and accommodation. The internal storage space on all our models is expansive and adjustable depending on the trip type and guest list. Picking through a list of places to stay in the Golden City? Looking for the best vineyards in Wine Country to indulge in California’s finest wines? We’ve compiled a concise list of hotels and restaurants around Napa Valley for your travel convenience. Pick from an endless selection of world-renowned wine tours, hotels, and spas and your driver will handle the rest. Take a seat in your private charter bus as your group partakes in a series of locally-acclaimed Napa Winery tastings and tours. Plan your trip from San Francisco to Napa Valley with a travel expert or ride through the nearby cities of San Diego, Santa Barbara, or Santa Ana, as you scale the California countryside. Your bus can even make stops in the San Francisco Bay Area, the city of Sacramento, Los Angeles, and more depending on your trip itinerary and schedule. Book a private travel method you can rely on with GOGO Charters. We aim to make the rental process as simple as possible for all our passengers. One of our rental experts will assist you in finding a custom charter bus that scales to your unique needs and travel budget. When you call us at 855-826-6770 we’ll help your group travel from coast to coast for a variety of event types. Call us anytime to receive a free, personalized bus rental quote for your next California getaway. We’re available 24 hours a day to service groups in need of U.S. travel.